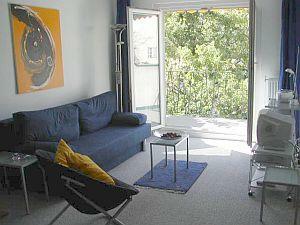 Vienna 1BR apartment with absolute quiet and green terrace, yet in central neighbourhood. Typical 'Altwiener Haus' close to station 'Wien Mitte'. With anteroom, a comfortable livingroom, kitchen, bedroom, wardrobe as well as bath and WC it has all nessecary rooms for a pleasant stay in the heart of Vienna. Best fit for a couple or family. The central location is the pole position for sightseeing and shopping in the city. You can reach the city center (St.Stephan's Cathedral) by foot. The traffic junction Wien Mitte offers connections to all other sights of Vienna and directly to the airport.